This house is split into two separate living accommodations. One is set over two floors and the other is just ground floor. The property’s garage is what separates the two of them as well as a small storage room. The ground floor accommodation has an open space dining/sitting room and has a covered porch to the back. There is a small kitchen and a bathroom. There is also a double bedroom. This part is the older part of the property but is perfectly habitable. To the other side of the garage there is the other living accommodation. This one has already had a lot of work carried out. Upon entering we go into the bedroom with a new bathroom to the right with the door to the left of the stairs. The stairs are made out of a nice wood, in keeping with the character of the property. Now on the top floor we come into the living room, kitchen and dining room. All of this is in open space. There is what appears to be a large window but once the shutters have been opened, they open up onto a balcony with 180º views over the countryside and you can even see the lake from here. This property has lovely grounds, with various fruit trees and good views. The property does have neighboring properties around but no one overlooks it. There is still various things that could be done to the property but it is perfectly habitable the way it is. 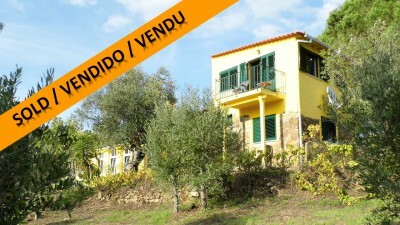 The property is situated in the village of Carvalhal, Serra. Carvalhal has a café but Serra is only 5 minutes away. Serra has several cafes restaurant and a small mini-market. There is a weekly market at Sundays. Serra is around ten minutes’ drive from the larger town of Tomar, which has supermarkets, shops, builders merchants, cafes, restaurants, health centres, schools, a weekly market, swimming pools and historic Convento do Cristo and Castle constructed by the Knight Templars in the 12th century. To Castelo de Bode lake it is only around 1 km. This lake is popular for all kinds of water sport activities including swimming, sailing, canoeing, scuba diving, wind surfing and water skiing. The lake is also a haven for wildlife and there are many river beaches close to the property, ideal for relaxing on sunny days at the water’s edge.